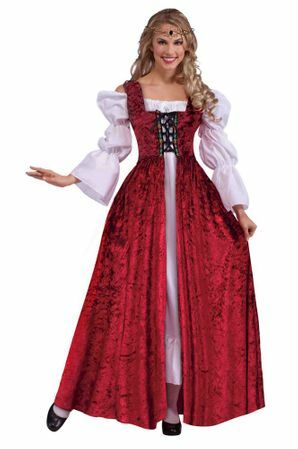 Available Sizes/Colors: Size "One Size Adult (6-12)" "One Size Plus (14-20)"
Lovely long burgundy crushed velvet overdress in a classic Medieval or Renaissance style. To be worn over the chemise or under dress of your choice! Includes dress with full skirt and black corset-style lacing on the bodice. One Size Adult fits size S to L. Chemise sold separately. By Forum Novelties. Check out more costumes and accessories in our Renaissance section!